There is no report suggesting the PM responded to that letter of Swamy. MaunMohan Singh as he is jokingly known. There was no response from Sonia Gandhi either. Such serious allegations would make any other person jump but not Ms.Gandhi. So why I should I not presume those charges hold some basis? 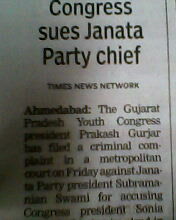 Now, a youth Congress leader from Ahmedabad has filed a case of defamation against Subramanian Swamy. TOI (January 8) reports that YC President Prakash Gurjar has filed a criminal complaint in a metropolitan court against Swamy for accusing Sonia Gandhi of being involved in the 2G spectrum scam. That’s inaccurate reporting. Swamy has actually accused Sonia Gandhi’s family of have gotten part of the loot. The petition seeks to prosecute Swamy under 153A,B and 500 of the IPC for making ‘defamatory’ statements and for ‘inciting communal feelings. Communal feelings? So now accusations of corruption also incite communal feelings? Anyway, never mind that. If you don’t know about IPC codes 153A,B and 500, never mind that either. Before I go further, let’s go back in time a bit. 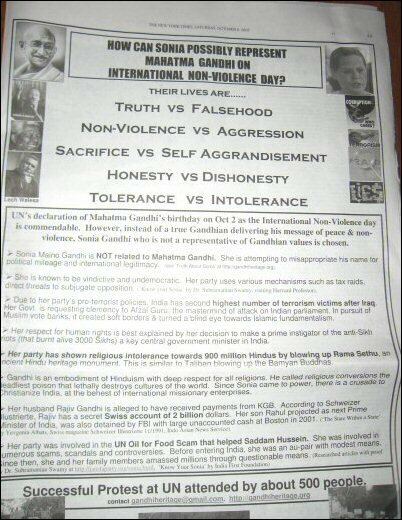 In October 2007 a group of NRIs released an ad in the New York Times.The full-page advertisement appeared in the New York Times on October 6, 2007, levelling several charges against Sonia Gandhi and her son Rahul during the UPA chairperson’s visit to the UN. 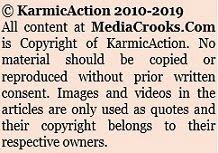 An organisation called Indian Overseas Congress (INOC) filed a 20-million dollar defamation suit against the advertisers. The INOC had earlier filed two separate cases relating to the advertisement, one in New Jersey and another in New York, seeking 100 million dollars in actual, compensatory, and punitive damages in addition to costs and disbursements, legal fees and other relief that the court might consider proper. The case was primarily dismissed because INOC had no locus-standi. Why? 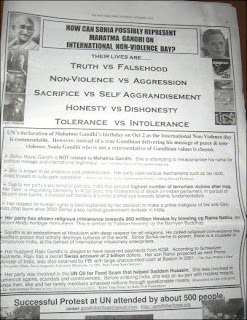 Clearly INOC was not the party against whom the ad was released. If at all, it should have been Sonia Gandhi herself who should have filed a case. But she didn’t. So whenever madam Sonia is accused of something there is someone else doing the dirty work. Read the related articles at Intellibrief and Thaindian. Considering most Congress members don’t act unless they are probably instructed by Ms.G or Mr.G one has to wonder why this youth Congress leader has chosen to file a defamation case when the accusations are against Sonia Gandhi. If there is indeed an injured party it would have to be Sonia Gandhi. So why doesn’t she file a case or make any public statements about the allegations made by Subramanian Swamy? Wait! This is a YC leader filing the case. Is it possible that YC leader Rahul Gandhi has instructed this guy to file a case? And that too in Ahmedabad of all places? But as in the case of the NYT ad in the US, this guy doesn’t have a locus-standi in the case and the court should have immediately dismissed the petition. 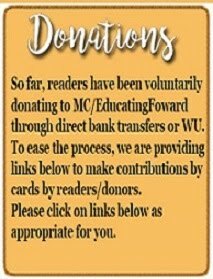 Instead the court has set a hearing date of January 18. Our courts, already bogged down with plenty of accumulated cases, keep admitting such frivolous petitions. One wonders if Sonia Gandhi has the guts to stand up for herself and defend herself or at least have the guts to file the defamation suit herself. Most of all, Swamy has made the allegations in a letter to the PM and not as a general public document or statement. My prediction : Subramanian Swamy will win and rub more salt into the Congress wounds.